Mandirola, an old name, has been resurrected to include three Brazilian species formerly included in Gloxinia: G. ichthyostoma, G. multiflora, and G. rupestris. Only the first of these appears to be in wide cultivation. 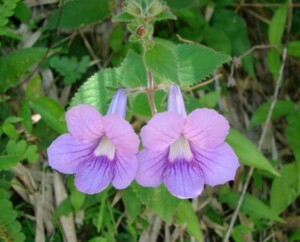 The species are very similar to some Achimenes species and were once included in that genus. Mandirola is more closely related to the distinctive Brazilian genus Goyazia than to Gloxinia and although both groups are closely related to Gloxinia, they differ from that genus in many ways and have thus been maintained as distinct genera.